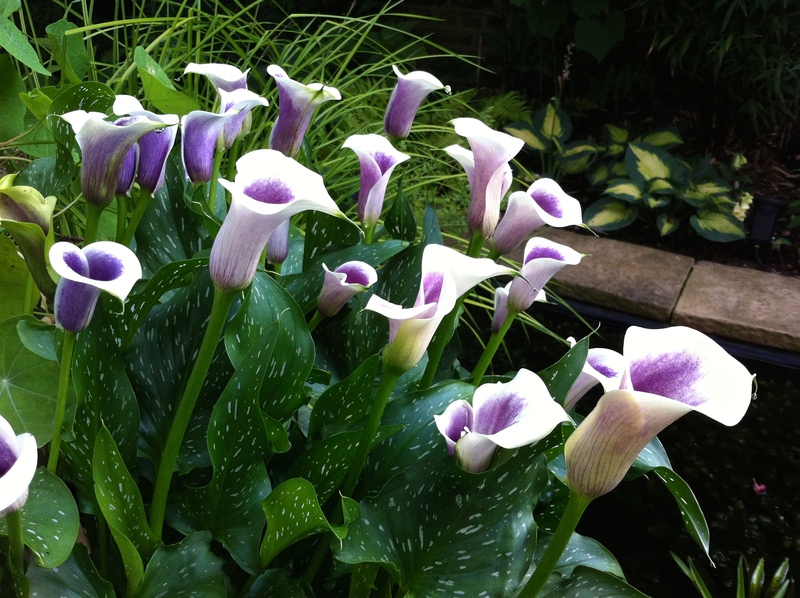 I have always rather shunned the colourful, smaller cousins of the Ethiopian lily, Zantedeschia aethiopica, mainly because of their artificial looks and regular, cellophane-wrapped appearances in florists’ shops. But, as with most plants, I eventually succumbed and decided to give them a try this year. The beauty of bulbs and rhizomes is that they can be picked up and transported home easily from shows. Many nurserymen will keep them in cold storage so that they burst quickly into growth after planting. 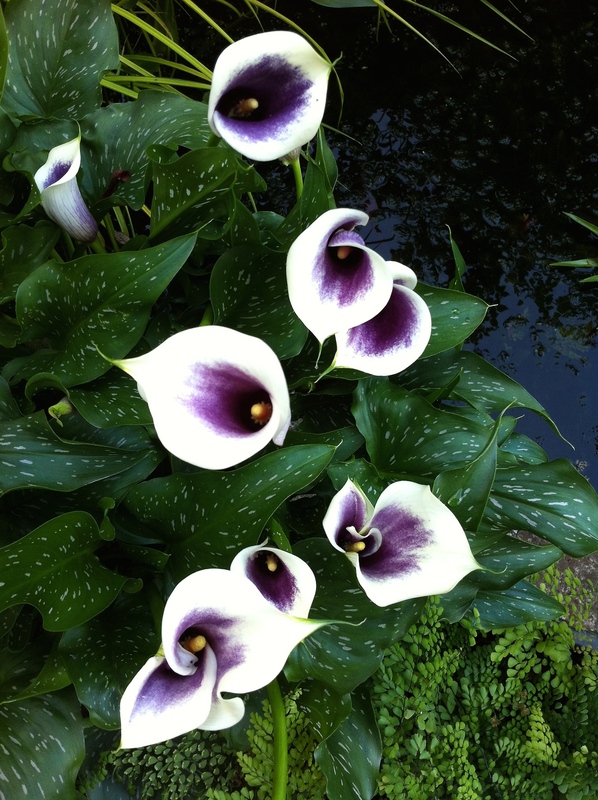 I found my Zantedeschia ‘Picasso’ at the Chelsea Flower Show in May and planted them in a pot promptly afterwards. I was recommended to use a free draining compost and keep them in a bright, sunny position. It worked, and in just six weeks four rhizomes have produced a mass of paint-splashed leaves and a surprising number of almost perfect blooms. The flowers (properly ‘inflorescences’) appear as if fashioned from sugar paste – yellowish white, smudged a deep mulberry purple. When the first blooms unfurled I was not sure I would like them, but en masse they work well. Nevertheless their appearance is a little too foreign to blend in with many garden plants, so I think they work best planted in a pot alongside other exotics or ferns. Unlike their larger cousins they do not appreciate their feet in the wet, but still look great at the water’s edge. I can’t think of easier, more trouble free bulbs to grow in pots, provided you have the right conditions and can keep them frost-free over winter. The spectrum of colours available extends from white through to yellow, orange, red, pink and inky purple. I for one will be trying more in future. Zantedeschia ‘Picasso’ is available mail order from Brighter Blooms in Preston, Lancashire.